Well, the diving continues and so do the bites. This marks 47 years that I have been diving, some years commercially, though most of the time it has been for fun. Over the years, I have been bitten by organisms living underwater (sand fleas and other microorganisms), bugs on the beach and bugs in rental houses. Most annoying of course is when these critters invade the bed at night and you wake up with new bites in the morning. When you combine this with the itching that occurs when I have relapses of Grover’s Disease, I have unfortunately become an expert at controlling itching. 1) Upon returning to the room, and again immediately before going to sleep, I douse the bites in hot water for 5 minutes — as hot as I can tolerate without burning the skin and permanently scarring it. When the itching becomes so bad that you cannot sleep, a person might consider even burning the skin if it were to offer some relief. However, don’t go to this extreme. It isn’t necessary. A dermatologist once told me that the hot water will calm the histamines in the skin that cause the itching for a few hours. 2) While in the shower, after applying the hot water, I then pour a small amount of seaweed powder directly onto the bites. Allow the seaweed to stay on the skin for a couple of minutes with the water turned off. You will feel a slight burning sensation because the seaweed contains salt which is being applied onto open bug bites. It will again burn a little more when you rinse the seaweed off with hot water. Don’t soap again after applying the seaweed. On this particular trip, I considered myself lucky. There were a total of only 50 bites on the legs, and only from the knees down. At this point using the combination of the hot water plus the seaweed, you can expect to gain an extra hour or two of relief, possibly even getting a full night’s sleep. However, if the bites happen to wake you in the middle of the night, just go back in the shower and repeat this so that you can calm things down until morning. 3) On this dive trip I added one additional experimental treatment. Since I live in California, I was able to get a hold of some raw CBD oil (don’t ask me how) and mixed it with coconut oil, olive oil. and shea butter to make a waxy cream. After washing off the seaweed and drying the skin very lightly, I applied a light layer of the CBD cream over the bites. The itching did not return for almost 12 hours. 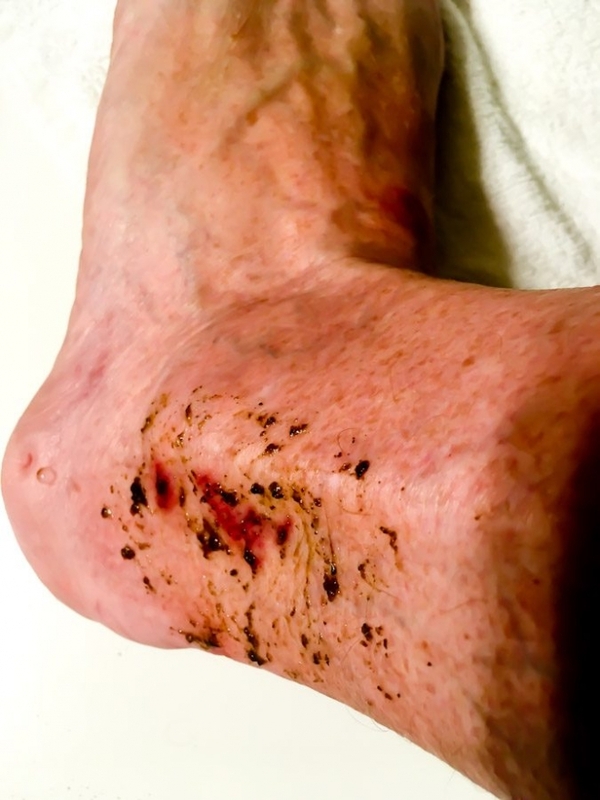 Having mastered bug bite itching, on my next dive trip I will be experimenting with several home remedies that hopefully will naturally repel the bugs and eliminate the bites entirely. Better to not allow the bite to occur rather than to have to deal with calming an itchy bug-bitten leg. I consider this just some of the annoyance in order to dive in some of my favorite places and digitally capture photos and videos of some of my favorite creatures. 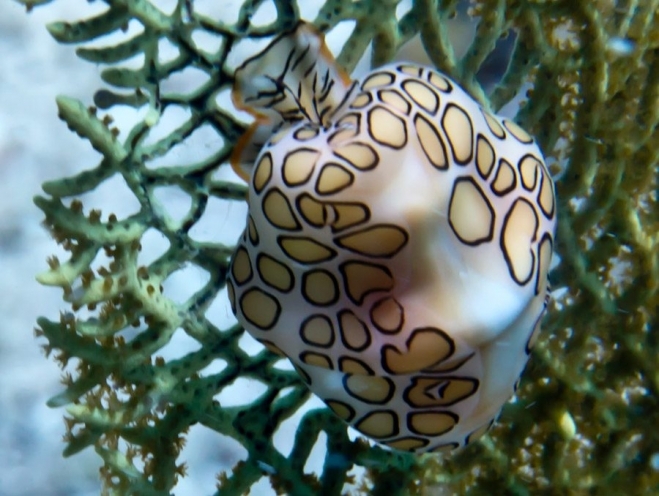 The nudibranch below is a snail-like organism, approximately one inch long. This guy was crawling across a fan coral. Once in a while I play with macro photography.